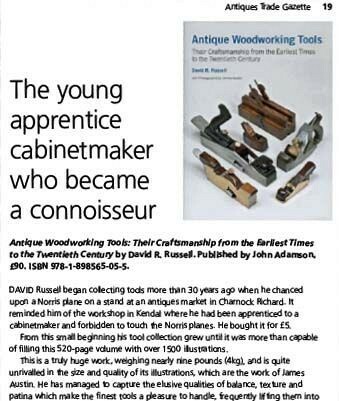 David R Russell, a colossus among collectors of antique woodworking tools, has died aged 82. Through a lifelong passion for early woodworking tools David built up what was hailed as one of the foremost collections in the Western world. Determined to share the vast knowledge he acquired along the way, he published Antique Woodworking Tools, a highly illustrated book that has become a standard work of reference for tool collectors and dealers and indeed for anyone interested in industrial archaeology or the history of material culture. Over many years David was to be seen at tool auctions in England, France and the US, bidding for some of the very best tools that came on the market. And when, after publication of his book, he made up his mind to dismantle the collection, he still attended the David Stanley Auctions, taking delight in seeing items from his collection end up in the hands of other collectors and woodworkers. He was born in 1935 at Burneside near Kendal in what was then Westmoreland. He left school at 15 to serve as an apprentice to the Kendal cabinet-maker and joiner Albert Benson in whose workshop his older brother Rodney was already making his mark. In 1959 he wed Eileen Wray. The young couple went back north in 1960 and David with his brother Rodney set up a partnership which eventually became Russell Armer Ltd. Following a heart attack, David sold Russell Armer but retained an ongoing role as an adviser. Obliged to take early retirement for health reasons, David bought and oversaw the restoration of a farmhouse in the Dordogne. At his new French home, he energetically pursued his interest in woodworking tools and continued gathering together one of the finest collections in private hands. 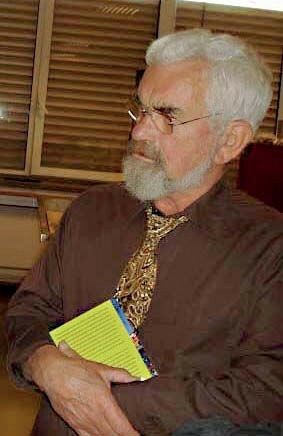 David dedicated many years to researching and compiling a definitive history of woodworking tools, drawing greatly on his own collection. He did so with the help of his assistant Robert Lesage and a professional team he formed around him, together with the unflagging moral support and encouragement of his companion, Susan Hargreaves. Though not a trained scholar, he had an unerring eye and a remarkable instinct for tools of great beauty or which were milestones in functional development. His book Antique Woodworking Tools: Their Craftsmanship from the Earliest Times to the Twentieth Century, with specially commissioned photographs by James Austin, was published in association with Bernard Shapero by John Adamson in 2010 to international acclaim. Retirement also enabled him to indulge his passion for wood-carving and birds. He built his collections of antiquarian bird books and 20th-century bird paintings with as much pride as he did his tool collection. David’s wife, Eileen, predeceased him in 2017, but he is survived by his children Craig, Claire and Anne and 10 grandchildren.